A short note to let you know that for the next two weeks I’ll be “On the Road Again.” Our grandson is graduating from High School and we aren’t about to miss that. So I’ll be out of pocket for a while. Don’t bother to check here before the first of July because you’ll be wasting your time. Don’t trash the place too bad while I’m gone. Prior to divisional play beginning in 1969, the Major Leagues had a playoff system to determine pennant winners in case the regular season ended in a tie. It wasn’t used all that often. The American League used it all of once (1948) and the National League a bit more frequently (1946, 1951, 1959, 1962). The most famous occurred in 1951. Arguably the best occurred in 1959. In 1959 the Milwaukee Braves were two-time defending NL champions. They featured Hall of Famers Hank Aaron, Eddie Mathews, Red Schoendienst, Enos Slaughter and Warren Spahn. They went into the last weekend of the regular season tied for first, then went 2-1 against Philadelphia to finish the year with a 86-68 record. Their opponents were the Dodgers, the team they had replaced atop the NL in 1957. But it was a vastly different Dodgers team. First, it was no longer in Brooklyn, having relocated to Los Angeles following the 1957 season. Second, most of the “Boys of Summer” Dodgers were gone. Hall of Famer Duke Snider, Gil Hodges, and Carl Furillo were still around; but the new team featured Don Drysdale, Wally Moon, Johnny Roseboro, and a wild lefty named Sandy Koufax. Drysdale and Koufax were on the 1956 pennant winning team, but neither was considered a major player on that team. Gone were Roy Campanella, PeeWee Reese, Don Newcombe, and Carl Erskine, a stalwart of the Brooklyn mound who began the year in LA, but retired before the season ended. The 1959 playoff format was a best of three series with LA getting two home games. The Milwaukee home game was 28 September in County Stadium. The next game was the following day in the LA Coliseum, the first playoff game ever on the West Coast. Game three, an if necessary game, would be in LA the 30th. With both teams having to win late in the season, the first game saw Danny McDevitt start for the visitors with Carl Willey on the mound for the Braves. With two out and second baseman Charlie Neal on second, Dodgers right fielder Norm Larker singled to drive in a run in the first inning. Milwaukee struck back in the second with two runs on a bunch of singles and an error. The two runs took McDevitt out of the game and brought in bullpen man Larry Sherry. LA got the run back in the next inning on three singles and a force out. In the sixth, Roseboro led off the inning with a home run putting the Dodgers up 3-2. Sherry pitched masterfully shutting out Milwaukee on four hits (and two walks) making Roseboro’s homer the deciding run. The next day the teams played one of the great playoff games ever. The Dodgers started Drysdale and the Braves countered with Lew Burdette. In the opening frame with an out Mathews walked, Aaron doubled, then Frank Torre doubled to plate both runs. The Dodgers got one back in the bottom of the first with a Neal triple followed by a single by Wally Moon. The Braves got the run right back on a single and error by Snider in the second. In the bottom of the fourth Neal homered to bring the Dodgers within a run. Again Milwaukee got the run right back with a Mathews home run in the fifth. It drove Drysdale from the game. The score remained 4-2 until the top of the eighth when catcher Del Crandall tripled and came home on a Felix Mantilla sacrifice fly. The score remained 5-2 going into the bottom of the ninth. With three outs to go, Burdette stumbled. Moon, Snider, and Hodges all singled to load the bases. Out went Burdette, in came bullpen ace Don MaMahon. He proceeded to give up a two-run single to Larker. Out went McMahon, in came Warren Spahn. A sacrifice fly by Furillo tied the game. It stayed tied through the tenth and eleventh, the Dodgers managing one hit in the eleventh. By the twelfth, Stan Williams was on the mound for LA and Bob Rush for Milwaukee. Williams got through the twelfth without giving up a hit, but with two out Rush walked Hodges. Joe Pignatano singled moving Hodges to second. Furillo then singled to shortstop Mantilla who was playing short instead of his normal second because of a defensive substitution in the seventh. Mantilla managed an error letting Hodges in with the winning run and putting the Dodgers into the World Series. They would win it over Chicago in six games. In the years since, playoff games prior to the World Series became a staple of baseball. Now we don’t consider it unusual to see a round of games between the end of the regular season and the Series. Back in 1959 it wasn’t at all normal. It happened three times previously in all of NL history. So there was a level of anticipation that was different from today’s playoffs. And it was the first postseason play (although technically the games counted as regular season games, they were considered by most a playoff) on the West Coast. With game two, the West Coast got a great introduction to playoff baseball. There’s an old baseball tale that goes like this. The pitcher winds up, blazes a fastball toward home, the batter, absolutely unable to see the ball stands still, the ball hits the catcher’s mitt with a resounding “whack”, then the umpire calls it a ball. The catcher turns around and says, “It was a strike, ump. Didn’t you see it?” The ump replies, “Nope, but it sounded high.” Great story. I’ve found versions of it about a half-dozen or so pitchers. The earliest version I can find goes all the way back into the 1890s and Amos Rusie. Rusie was born in Indiana in 1871. The family moved to Indianapolis where Rusie dropped out of school to work in a factory. The factory had a team, Rusie could pitc,h and the team played against barnstorming big league teams. Rusie successfully shut down both the Washington and Boston National League teams in 1888 and was picked up by the Indianapolis Hoosiers. He was 18, went 12-10, walked more men than he struck out, and the team finished 7th. Indianapolis folded after the season leaving Rusie without a team. The NL decided to send most of the good players, including Rusie, to the New York team. Rusie was upset at not being able to negotiate a contract with any team willing to pay him and it led to problems for his entire career. He became a star, liked New York, found a wife, and was the toast of the town, but never quite got over being sent to New York against his will. He was brilliant as a pitcher. He was also wild. In his first three years he was 114-85 with 982 strike outs and (read this number carefully) 821 walks. He led the NL in strikeouts twice and in walks all three years. In 1893 they moved the pitching distance back to the current 60′ 6″ and a number of sources credit Rusie with the change. Batters feared both his speed and his wildness. OK, maybe, but what is certain is that Rusie flourished at the new distance. He had 33 wins in 1893, 36 in 1894. His strikeout totals went down, but he still led the NL. His walks also went down, but he continued to lead the league in bases on balls. To be blunt, Rusie never really overcame his wildness. His Triple Crown year was 1894. He won 36 games (losing 13) with a 2.78 ERA (ERA+ 188) and stuck out 195 men, his lowest total of strikeouts since his rookie year. He also led the league with three shutouts and (you knew this was coming) 200 walks. That makes him the only Triple Crown winner to lead his league in both strikeouts and walks. I’m not a big fan of pitching WAR (hitting WAR is OK), but his WAR for 1894 is 13.8. For the season, his team finished second, but qualified for the newly contested Temple Cup. The Giants won the Cup in four straight games. In 1895, Rusie dropped back to 23-23 for a record but still led the NL in strikeouts. For the first time since his rookie campaign, he didn’t lead in walks. But he was also involved in one of his perennial contract disputes with the Giants. Unwilling to accept the club offer, he sat out all of 1896. The Giants, who had finished ninth in 1895, moved up to seventh in 1896. That didn’t help Rusie so he reluctantly resigned for the 1897 season. He was good again in 1897, winning 28 games and his second ERA title. For the first time since 1892 he failed to lead the NL in strikeouts (the 1896 hold out year excepted). He had 20 wins in 1898 before hurting his shoulder attempting a pick-off. No one knew it at the time, but his career was over. He sat out 1899 and 1900 before attempting a comeback in 1901. He was traded to Cincinnati (more on that later), went 0-1 in three games striking out six final batters (and walking three). He was done. He worked at a paper mill in Indiana after retirement, then moved to Seattle where he worked as a steamfitter. In 1921 he became superintendent at the Polo Grounds, a job he held through 1929. John McGraw did that kind of thing for old ballplayers. He went back to Seattle where the Great Depression hurt his financial interests badly. He was injured in a car accident in 1934 and retired. He lingered into 1942 when he died in Seattle, where he is buried. In 1977 the Veteran’s Committee chose him for the Hall of Fame. Over his 10 year career Rusie won 246 games and lost 174 (.586 winning percentage). 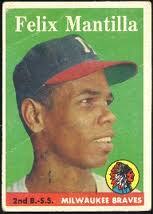 He walked 1707 men and struck out 1950. His ERA was 3.07 (ERA+129). He gave up 3389 hits and 1288 earned runs in 3779 innings. He led the NL in wins and losses once each, in shutouts and strikeouts four times each, in ERA twice, and in walks five times. Rusie reminds me a lot of guys like Bob Feller, Nolan Ryan, and Hal Newhouser. All three were great fastball pitchers who lacked control, although all, especially Ryan, managed to gain at least some control as their career progressed. Rusie was also like that, only a half century earlier. His feats were legendary. One story has it that in one game the catcher didn’t throw the ball back to Rusie. Rusie then simply wound up, faked a throw, the batter swung, and the umpire called a strike. You don’t get many stories like that. Oh, and that trade to Cincy? Well, it seems the Reds were giving up on a young right-hander and decided to take a flier on Rusie. So for a washed up Amos Rusie, the Giants got a new pitcher named Christy Mathewson. Worked out well for New York, not so well for the Reds. 1. Tim Keefe was born New Year’s Day 1857 in Cambridge, Massachusetts, the same town as his contemporary rival John Clarkson. 2. His Major League debut was in 1880 at Troy (New York). He pitched in 12 games, won six, and won the ERA title with a record low 0.86 and an ERA+ of 293. 3. 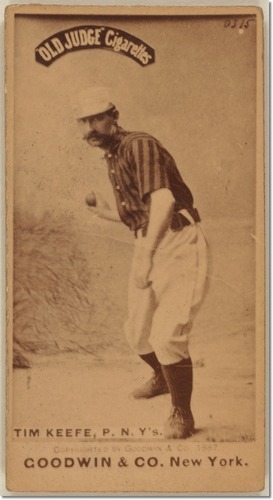 When Troy folded after the 1882 season he moved to New York of the American Association where he pitched for two seasons, including the 1884 pennant winning campaign. In the first postseason play between Major League teams, he was 0-2 as his team lost to Providence in three games. 4. Between 1885 and 1889 he played for the New York Giants leading them to a pair of pennants and postseason triumphs in 1888 and 1889. He was 4-1 in the two postseasons. 5. He was the brother-in-law of John Montgomery Ward (they married sisters), head of the Brotherhood of Professional Base Ball Players, the first sports union. Keefe supported the Brotherhood and took his services to the Player’s League in 1890. 6. With the folding of the Player’s League in 1891 he went back to the Giants, did poorly and was traded to Philadelphia. 7. He stayed in Philly through 1893 and the transition to a pitching distance of 60′ 6″. At was 36 and with a new set of pitching regulations, he finished 10-7 with a 4.40 ERA and retired at the end of the season. 8. His Triple Crown season was 1888. He went 35-12 (.745 winning percentage), had an ERA of 1.74 (ERA+156), and stuck out 335 men (while walking 90). He also led the National League with eight shutouts. And we should remember that the pitching distance at the time was 50′ and there was no mound. 9. For his career he was 342-225 with an ERA of 2.63 (ERA+126). He had 2564 strikeouts, 1233 walks, gave up 4438 hits, and 1474 earned runs in 5050 innings pitched. At his retirement the 342 wins was second only to Pud Galvin. 10. He is credited with inventing the change-up in 1883. I’m not sure that’s true because it implies no one changed speeds prior to 1883. My guess is he figured out how to throw both his fastball and a slower pitch with the same arm motion. That’s strictly a guess. 11. After retirement he umped a little then coached at Harvard, at Princeton, and at Tufts University. 12. He died in 1933 in Cambridge and is buried in the same cemetery as Clarkson. 13. He was elected to the Hall of Fame in 1964, 31 years after his death. Sport is about heroes, not tragedy. At least that’s the way most of us want it. Unfortunately, this is not a pretty tale. It’s an awful ending to the life of a great ballplayer. You watch a man play, you read about his life, you root for him, but you want everything to end well. In the case of John Clarkson, it doesn’t. John Clarkson was born in July 1861 in Cambridge, Massachusetts. He grew up with two advantages. First, his father was a watchmaker and jeweller who made decent money for the era. Second, the father had a co-worker named Harry Wright (yep, that Harry Wright). There’s no direct evidence about the matter, but it’s likely that Wright made at least a small impression on Clarkson when it came to baseball. Whether Wright did or didn’t influence the kid, Clarkson played for his local high school team (both catcher and pitcher), then joined the family business while attending a local trade school. There’s a common rumor that Clarkson attended Harvard. Although the family lived in Cambridge and both brothers attended the university, John Clarkson didn’t. He did play amateur baseball and played it well. In 1882 he pitched well enough against the Worcester Ruby Legs of the National League that the team offered him a contract. Don’t you just love both the nickname and the idea that Worcester, Massachusetts could have a Major League team in 1882? It shows you just how much Major League Baseball was in its infancy in the 1880s. Now a professional, Clarkson was another of those players who wasn’t an instant success. He went 1-2 with an ERA of 4.50, but did hit .364 with two doubles in three games. He was released early in the season complaining of a sore arm. The next season he played in the Northwestern League. 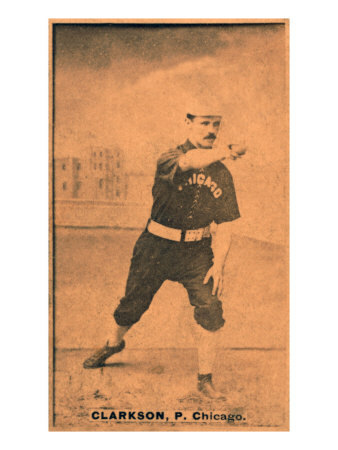 He did well enough to make it back to the National League in 1884, this time with Chicago. This is as good a point as any to discuss the pitching changes that were to dominate Clarkson’s career. He began his career pitching at 45 feet and throwing underhand. The rules were changed to move him back to 50 feet and allow him to throw sidearm. Then came the change to throwing overhand. Finally the powers that be moved the pitcher back to 60′ 6″ and put in a mound. Clarkson pitched through all of those changes and did well until the final change. It’s something of a testament to his abilities that he managed to survive as many changes as he did before finally reaching a point where he was ineffective. He did well enough in 1884, but his career took off in 1885. For the next five years he was utterly dominant. And for the following three seasons he was really good. He won 53 games in 1885 (second all time and still the Cubs record), led the NL with 308 strikeouts (his career high) and 10 shutouts (also a career high). Chicago finished first and participated in the postseason championship round against the winner of the American Association (St. Louis). He started two games, one ended in a tie and he lost the other. The Colts (now the Cubs) repeated in 1886 and Clarkson was 36-17, but this time Chicago won the postseason clash with Clarkson picking up two wins. He again led the NL in wins and strikeouts in 1887. The next year was a watershed for Clarkson. Not only did he win 33 games in 1888, but he changed teams. Dissatisfied with Chicago and an early member of the Brotherhood of Professional Base Ball Players, the first sports union in the US, he jumped to Boston (now Atlanta) for the enormous sum (for the era) of $25,000 for three years and $10,000 up front. Boston finished fourth. 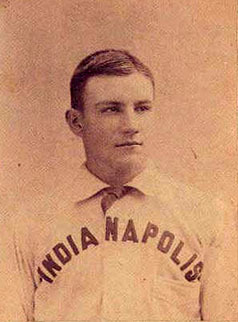 Clarkson stayed with the team through 1891, meaning that although a member of the Brotherhood, he didn’t jump to the Player’s League in 1890. It cost him friends and worsened an already developing drinking problem. He had one last great season with Boston. In 1889 Clarkson won 49 games and lost 19. He led the NL in wins, ERA (2.73), winning percentage, shutouts (8), walks (203), and had 284 strikeouts to give him the pitching Triple Crown. His modern numbers show a WHIP of 1.277 and an ERA+ of 150. Both also led the National League. 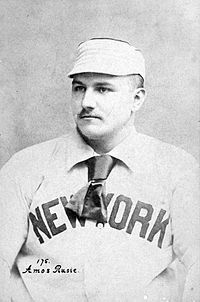 In 1892 he was traded to Cleveland where he joined a new pitcher named Cy Young as the mainstays of the Spiders. It was the year of the split season and Cleveland won a part of the pennant. They faced Boston, Clarkson’s old team, in the postseason and lost. Clarkson pitched in two games, losing both. In 1893 came the move to a mound for the pitcher. Clarkson didn’t adjust well. His record was mediocre (16-17) and his ERA soared to 4.45. His previous high in a season in which he pitched more than three games was 3.27. He was even worse in 1894 and was traded to Baltimore. He refused to report and was through at age 32. So what have we got at this point? Clarkson retired with 328 wins (an NL record at the time), 178 losses (.648 winning percentage), 1978 strikeouts, 1191 walks, a 2.81 ERA (ERA+133), 4295 hits, and 1417 earned runs in 4536 innings pitched. Most people ignore his hitting, but he was also a very good hitter for a pitcher (you knew that caveat was coming, didn’t you?). He hit .219 but had 24 home runs (a record at the time), 232 RBIs, and never struck out 20 times in a season. He also played 27 games in the outfield (and a handful at both first and third) and was an adequate fielder. So far not too bad, right? But now comes the ugly stuff. He ran a minor league club, opened a cigar store (actually a chain of them) and was moderately successful. In 1905 his mind snapped. Something was wrong and the sources can’t seem to agree on exactly what went wrong. Some say he suffered paranoia, others depression, others come up with different theories. Whatever it was there is universal agreement that Clarkson was a heavy drinker and this added to his problems and to his instability. One story indicates he killed his wife; however, she survived him by several years so this tale can be discounted. Other versions of the story say he stabbed her but there is no record of an arrest nor any statement from her saying it occurred. Whatever happened, Clarkson was institutionalized. He spent much of the rest of his life in the McLean Psychiatric Hospital in Massachusetts with occasional home visits allowed. By the end he was getting longer visits home, often lasting weeks, so apparently things were improving at least a little. In January 1909 he developed pneumonia and died in February. He is buried in Massachusetts in the same cemetery as longtime rival Tim Keefe. In 1963 the Hall of Fame enshrined Clarkson at Cooperstown. I hate finding out things like this. You want your heroes to not only shine while playing, but also to have happy endings. Clarkson had a terrible end (except for the Hall of Fame, which he never knew about) and that’s a great shame. I prefer to dwell on the baseball hero, not the mental patient. Unfortunately, both are part of his legacy. You are currently browsing the Verdun2's Blog blog archives for June, 2012.